WYTHEVILLE, Va. – Have a stack of old tires? Don’t know what in the world to do with them? The Wythe County Solid Waste Department will be holding a tire collection day on Saturday October 6, 2018. Wythe County Code Enforcement Officer A.B. Dunford said the collection day provides an excellent opportunity for residents to discard tires. WYTHE COUNTY, Va. – The Joint Public Service Authority of Wythe and Bland Counties will be hosting its annual Household Hazardous Waste Disposal Day on Saturday, September 22, 2018. The event is open to all Wythe and Bland residents. The day will be held at the Transfer Station located at 169 Kents Lane in Wytheville, Va. from 8 a.m. to noon. According to officials, acceptable items for the disposal day include: computers and monitors, copiers, TV’s, ballasts, fluorescent lights, batteries, paints, poisons and corrosives. Florence has moved North and away from Virginia. Although some of the effects are still in the county, we have survived with minor issues. Our hearts and prayers are with the communities of the Carolinas and Virginia that were so greatly impacted by this storm. Wythe County would like to take a moment to thank all of its citizens for being prepared and making preparation to be safe during this storm. It takes everyone in the county working together to provide the safest community that we can. Thank you for being prepared. Volunteers prepared locally for Hurricane Florence. 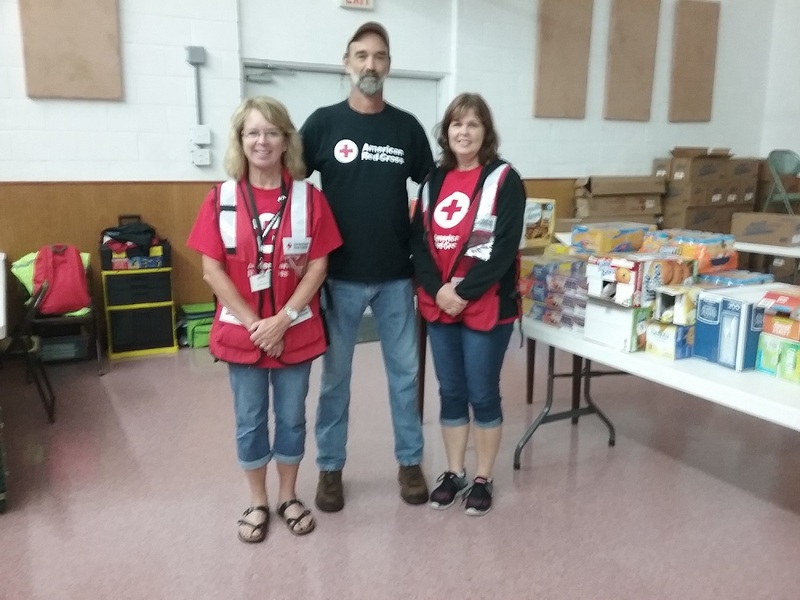 Red Cross volunteers were on hand and prepared with food and supplies in case of an emergency Sunday afternoon at Draper Valley Pentecostal Holiness Church. Emergency Management officials continue to monitor the situation. The New River is forecasted to rise 15 feet in the next 24 hours. Residents along the New River are encouraged to be vigilant and be prepared to move if necessary. The American Red Cross has a shelter open at the Draper Valley Pentecostal Holiness Church. Rains from Florence will begin today and continue throughout the first of the week. As of today, Wythe County could receive up to 5 to 9 inches of rain in areas. With the potential of these amounts to fall, flooding as well as land slides are potential hazards. River flooding is also a threat for our county. There are projections of moderate to major flooding for the New River with Galax being projected to be 15 feet above flood level and Pulaski to be 22 feet above flood level. AEP has lowered the levels of water at the Buck and Billesby Dam and are not holding extra water at this time. Hurricane Florence has arrived to the Southeast coast of the United States. Florence is still a slow-moving storm that is unloading a large amount of rain. The National Weather Service has forecasted this morning for the rains to begin hitting Wythe County on Saturday evening and continue through Monday. The bulk of the storm will affect us Sunday and Monday. Please be aware that this storm could still cause hazards for Wythe County. Florence continues to be projected to affect our county. With the recent amount of precipitation that we have accumulated over the past month, Wythe County is in prime condition for flooding with very minimal additional rainfall. The Department of Emergency Management is urging citizens in areas that are prone to flooding to make arrangements now. If you live in one of these areas, please heed the warnings and be prepared. Make arrangements for safe shelter outside of the affected area. Flood waters and damages from them could last 48 hours or more. Whether you go to family or friends houses or a hotel, this could be safer than trying to ride the floods out at home. In light of the upcoming event of hurricane Florence, there is a potential for large amounts of rainfall which could cause flooding in low lying areas and especially in the designated flood zones of Wythe County. We would like to remind everyone to please take precautions and move your camper or RV out of these areas before it’s to late. A camper swept away by flood waters could cause a dangerous situation if it prevents the flow of water under a bridge. Please remove any items that are an accessory to your camper that may have the potential to float such as propane tanks. If there are questions or concerns or you are not sure if you’re in a flood zone, contact the Wythe County Building Department and we will help you assess the flood zones. We have been receiving phone calls to our Emergency Communications Center about the upcoming storms. Wythe County would like to address the situation. Hurricane Florence looks from reports to be heading towards the Carolinas and moving inland. The direct path still has time to change and may vary from the predictions. In any case, the Department of Emergency Management urges the citizens of Wythe County to take steps to always be in a state of readiness no matter the situation.